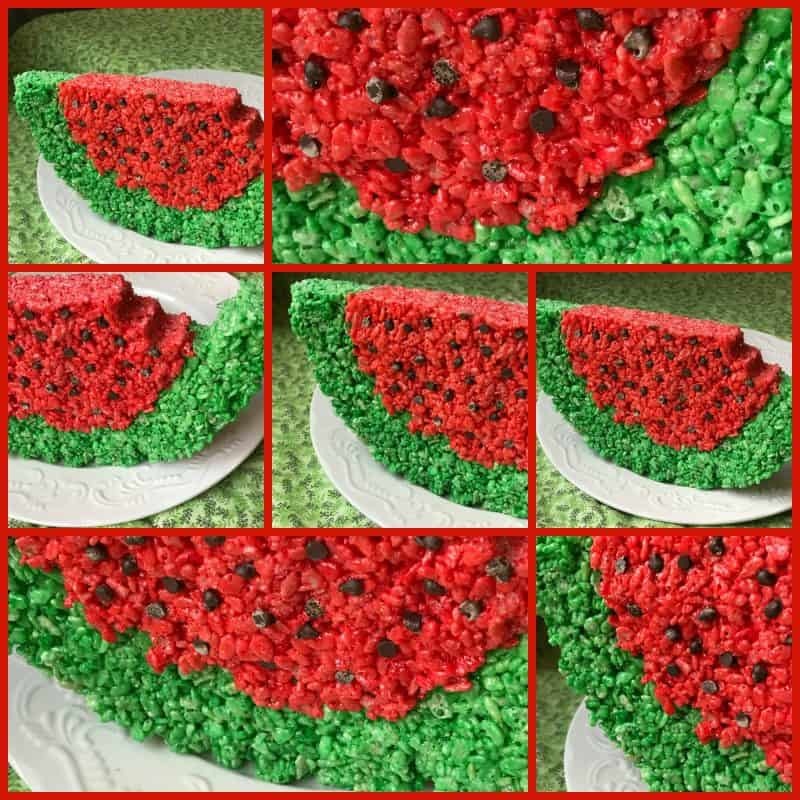 Watermelon Shaped Krispie Treats is the first recipe in a weekly series that we are going to feature here on Turnips 2 Tangerines called “Play with your Food, A Series for Kids” We thought we’d change things up a little this summer and feature a kid friendly recipe every Wednesday. We have shared so many recipes here on Turnips 2 Tangerines but haven’t really focused on kid friendly recipes. First up in our “Play with your Food, A Series for Kids,” is what else, but that kid friendly classic rice krispie marshmallow treats. Everyone loves this classic treat. 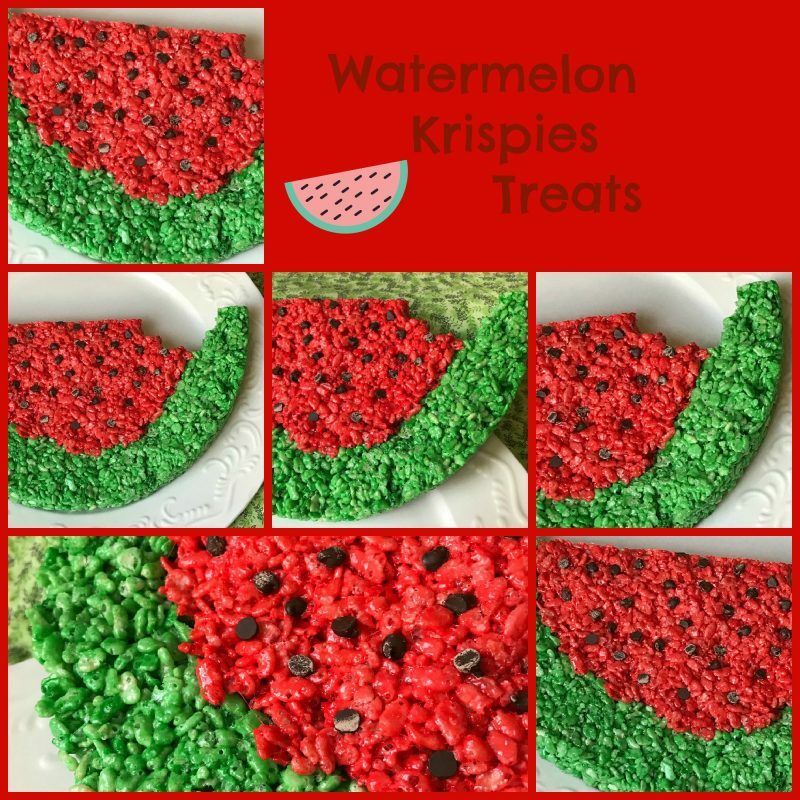 Our treats are made to look like a slice of watermelon and the “seeds” are mini chocolate chips. Other than the addition of gel food coloring and mini chocolate chips, this recipe is the same recipe that families have been making for for years. If your like me, you’ve made this recipe so many times you don’t even need a recipe to make rice krispie treats but don’t worry, the recipe is included below. Looking for more rice krispies marshmallow treats? Give these a try, your kids are gonna love them, any which way you make them. Fall Colored Marshmallow Treats and Red and Blue Krispie Treats. A fun twist on an old favorite. In a large medium saucepan melt butter and 22 marshmallows until smooth. Stir in 3 drops or more of green food coloring or until you reach desired color. Add 3 1/2 cups rice krispies cereal. Stir until cereal is well coated. On a piece of buttered wax paper, form rice krispie/marshmallow mixture into a 2-inch ring, leaving the middle empty. In a second medium saucepan, melt butter and the remaining marshmallows until smooth. Stir in 3 drops or more of red food coloring until you reach desired color. Stir in remaining rice krispies cereal. Stir until cereal is well coated. Spoon krispie/marshmallow mixture into the center of the ring and press down. Lightly press mini chocolate chips into the red cereal mixtiure to form seeds.